The solution is simple to How to hide the mouse pointer eg cursor in Windows-10 while typing a text or press a keyboard key! The solution for Windows 10, Windows 8.1, Windows 7 ... and other Windows OS! Please use The Keyboard Shortcut Windows-Logo + X and open the Windows-10 Control Panel, select the symbol Mouse. In the Mouse Properties select the Tab Pointer Options activate the option: Hide pointer while typing. (... see Image-1) but that works not always, then use : ... the Freeware AutoHideMouseCursor. (Image-1) Windows-10 hide the mouse pointer while typing! To ensure that the pointer (cursor) doesn't block your view of the text you're typing, under Visibility, select the Hide pointer while typing check box. To find a misplaced pointer by pressing the Ctrl key, under Visibility, select the Show location of pointer (cursor) when I press the Ctrl key check box. An very efficient way to hide the Mouse Pointer (cursor) is the Freeware AutoHideMouseCursor. 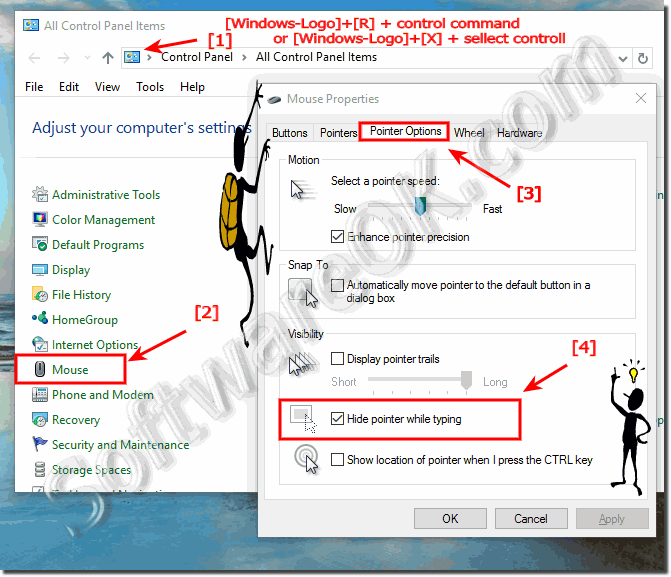 (Image-1) Auto hide the mouse pointer in Windows-10 while typing! Windows-10 - FAQ-171: How to hide the mouse pointer in Windows-10 while typing! If you want to burn a CD, or DVD from an ISO file on your Windows-10 OS, insert an recordable CD, Blu‑ray, DVD, or Disc into your disc burner. Burn a CD or DVD or from an ISO file on Windows-10? How to see all shared folders on Windows-10 Home and Pro? Wie kann man Touchscreen-Fenster 10 umschalten? Wie schalte ich den Touchscreen unter Windows 10 oder 8.1 aus? Wie Sie Ihren Laptop-Touchscreen in Windows 10 und 8.1 deaktivieren?